The features shown in this selection chart represent the extent of performance of each Series. Not all combinations of characteristics are feasible at an individual product. Please refer to relevant product sheets or consult our customer service. 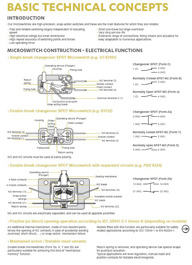 For more information see also the “Selection guide” and the “Basic technical concepts”. 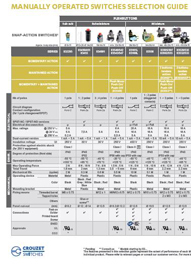 Note : data contained in product sheets dated 2016 and before may differ from the features shown in this selection chart. Update is in progress. Please contact us for confirmation.